Rendering of what Monsanto's greenhouse in Avra Valley will look like. The land at the southwest corner of Sanders and Twin Peaks roads in Marana is where Monsanto plans to build its greenhouses. 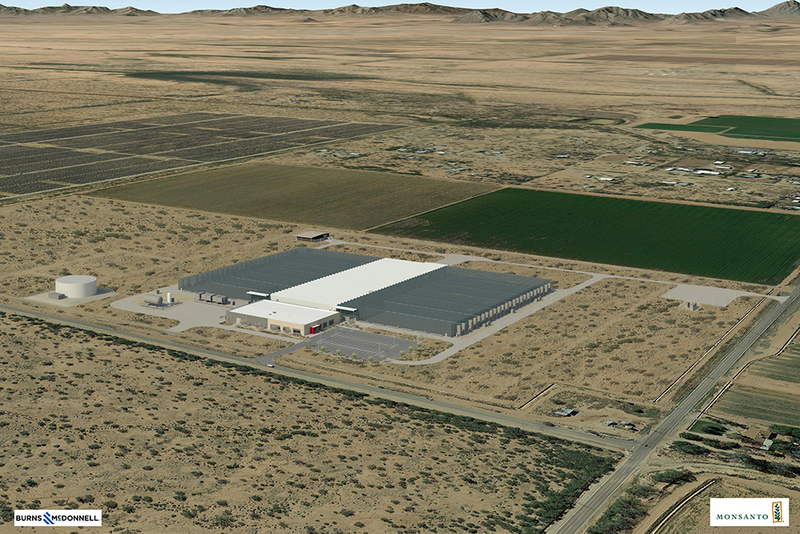 The agribusiness giant Monsanto has withdrawn its proposal for a property tax arrangement with Pima County that would have substantially reduced property tax payments at a planned greenhouse near Marana. That’s according to a Feb. 15 letter sent to the county by government affairs director George Gough. “I am writing to inform you that after much thought, the Monsanto Company has decided to withdraw our Foreign Trade Zone Payment In Lieu of Taxes Agreement proposal scheduled for consideration by the Pima County Board of Supervisors at their February 21, 2017 meeting,” the letter reads. “Monsanto Company remains committed to partnering with the community in Pima County and we look forward to working with you in the future,” it goes on to say. In response, County Administrator Chuck Huckelberry requested that all of the items slated for discussion next Tuesday be removed from the supervisors’ agenda. Monsanto said in an email that it was going to continue with the project to build and operate the greenhouse to grown corn on seven acres of land near Marana. Monsanto has already purchased 155 acres at the intersection of Twin Peaks and Sanders roads. A company official said it would move forward with its commitment to the area, including a contribution in lieu of lower property taxes of $500,000 to the Marana Unified School District Foundation, creating a community advisory panel and to voluntarily report the usage of restricted-use pesticides at the greenhouse. The supervisors were to consider whether to support Monsanto’s application for foreign-trade-zone status, which would substantially reduce its property tax burden over the next 10 years. In exchange for receiving that support, the company would commit to spending at least $90 million on the development and hiring at least 50 people at an average salary of roughly $44,000. A foreign-trade-zone designation would drop the property’s assessment ratio from 15 percent to 5 percent. The annual difference in property taxes paid to the county after $96 million in development would be around $370,000 lower with the FTZ rate, documents show. The U.S. Commerce Department, not the county, approves FTZ applications. The property tax reductions are established by state law, according to an earlier memo from County Administrator Chuck Huckelberry to the board. After delaying its vote on Monsanto, the county held several public meetings earlier this year to discuss the issue. Most of those speaking at the meetings were opposed to Monsanto. Speakers raised concerns about the potential health impacts of Roundup, a Monsanto herbicide; about Monsanto’s pending merger with Bayer, another biotech giant; about impacts of genetically modified organisms used on Monsanto’s seed crops; and about what they see as Monsanto’s incompatibility with the county’s burgeoning sustainable agriculture movement. Federal official clears up the confusion over that fact.